Roof Repair Vero Beach | The Roof Authority, Inc. Whether it’s from damage or old age, eventually your roof will need to be repaired somehow. When the time comes, make sure you trust the best roofers in Vero Beach, The Roof Authority. In these categories, we’ll go over all of the reasons why your roof should be repaired promptly and regularly. We’ll go over what could happen to your roof should you not get it repaired when it needs to be and possible at home solutions you can do before you call a professional roofer. 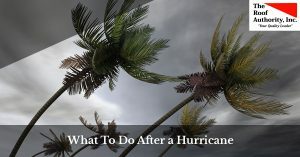 In the event of hurricanes or other natural disasters, we’ll also go over a few ways you can help strengthen your house before the next big storm hits. On a lighter tone, we’ll give you some ideas on how to decorate your house for the holidays as well. Choose any blog in this category to get started!